NASA’s Curiosity rover has discovered evidence that an ancient Martian lake had the right chemical ingredients that could have sustained microbial life forms for long periods of time – and that these habitable conditions persisted on the Red Planet until a more recent epoch than previously thought. Furthermore researchers have developed a novel technique allowing Curiosity to accurately date Martian rocks for the first time ever – rather than having to rely on educated guesses based on counting craters. All that and more stems from science results just announced by members of the rover science team. Researchers outlined their remarkable findings in a series of six new scientific papers published today (Dec. 9) in the highly respected journal Science and at talks held today at the Fall 2013 Annual Meeting of the American Geophysical Union (AGU) in San Francisco. The Curiosity team also revealed that an investigation of natural Martian erosion processes could be used to direct the rover to spots with a higher likelihood of holding preserved evidence for the building blocks of past life – if it ever existed. The ancient fresh water lake at the Yellowknife Bay area inside the Gale Crater landing site explored earlier this year by Curiosity existed for periods spanning perhaps millions to tens of millions of years in length – before eventually evaporating completely after Mars lost its thick atmosphere. Furthermore the lake may have existed until as recently as 3.7 Billion years ago, much later than researchers expected which means that life had a longer and better chance of gaining a foothold on the Red Planet before it was transformed into its current cold, arid state. Researchers also announced that they are shifting the missions focus from searching for habitable environments to searching for organic molecules – the building blocks of all life as we know it. Why the shift? Because the team believes they have found a way to increase the chance of finding organics preserved in the sedimentary rock layers. “Really what we’re doing is turning the corner from a mission that is dedicated to the search for habitable environments to a mission that is now dedicated to the search for that subset of habitable environments which also preserves organic carbon,” Curiosity Principal Investigator John Grotzinger, of the California Institute of Technology in Pasadena, said at an AGU press conference today. Earlier this year, Curiosity drilled into a pair of sedimentary Martian mudstone rock outcrops at Yellowknife Bay known as “John Klein” and “Cumberland” – for the first time in history. Grotzinger said the ancient lake at Yellowknife Bay was likely about 30 miles long and 3 miles wide. Powdered samples deposited into the rovers miniaturized chemistry labs – SAM and CheMin – revealed the presence of significant levels of phyllosilicate clay minerals. These clay minerals form in neutral pH water that is ‘drinkable” and conducive to the formation of life. “Curiosity discovered that the fine-grained sedimentary rocks preserve evidence of an environment that would have been suited to support a Martian biosphere founded on chemolithoautotrophy,” according to one of the science papers co-authored by Grotzinger. 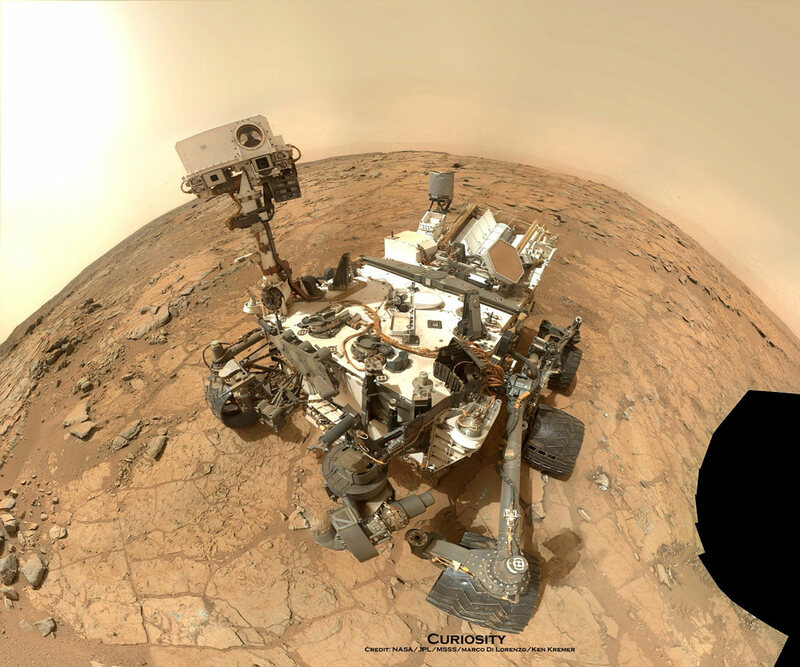 The rover has detected key elements required for life including carbon, hydrogen, oxygen, sulfur nitrogen and phosphorous. The team is still looking for signatures of organic molecules. Right now the researchers are driving Curiosity along a 6 mile path to the base of Mount Sharp -the primary mission destination – which they hope to reach sometime in Spring 2014. But along the way they hope to stop at a spot where wind has eroded the sedimentary rocks just recently enough to expose an area that may still preserve evidence for organic molecules – since it hasn’t been bombarded by destructive cosmic radiation for billions of years. Stay tuned here for Ken’s continuing Curiosity, Chang’e 3, LADEE, MAVEN and MOM news. I strongly beleive that they should keep searching on Mars for more life than one fossil. The lake bed only exposed for 30 million years? Who came up with that figure? Great! So what is this “novel technique allowing Curiosity to accurately date Martian rocks”!? The only one that comes to mind are the isotope statistics but I get the feeling that’s not it.